There are several options for finding information. For UCLA students on their one week required clerkship in Ophthalmology or if you are interested in learning anatomy of the eye in detail just follow the tutorial one page at a time by clicking on the "NEXT" button below after reading this page. You may continue through the tutorial by finding the "Next" button or a "Link" to queries that the page presented. The tutorial is written so you can test your knowledge as you proceed. Be sure to read this entire page to find the "NEXT" button. If you click on sublinks on other pages you may find your way to the vasculature of the eye site prematurely which is the end point for the UCLA tutorial. So for UCLA Students be sure to return to the page prior to the sublink, go to the bottom and click the "NEXT" button. For those that just want to survey the subject, click on the links below one at time and return to this page each time. To link quickly to a particular topic use the drop down list above or use Google to search this site. To access these topics click on the linked subject, use the drop down list or simply read each topic and link to the answers or next button to move through the tutorial. We begin with an overview. A horizontally cross sectioned human eye is shown here. CLICK ON THE PHOTO TO ENLARGE IT AND IDENTIFY THE NUMBERED STRUCTURES. Check your answers below. 1. Cornea- composed of 5 layers, epithelium, Bowman's layer, stroma (the thickest portion), Descemet's membrane and the endothelium. 2. 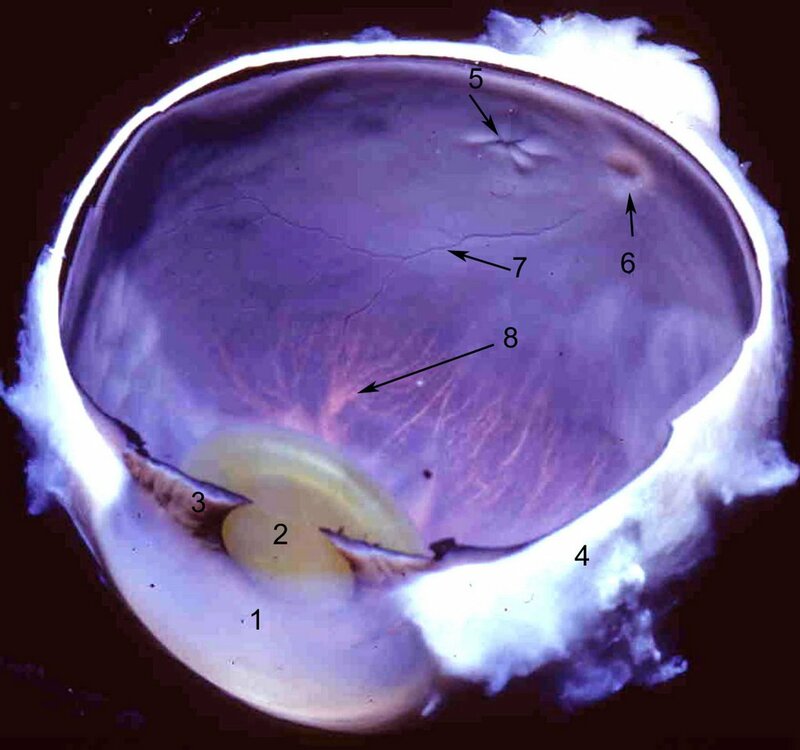 Lens- composed of an anterior lens capsule, epithelium, cortex nucleus and posterior capsule. 4. Sclera- the white tunic protects the inner structures. Thinnest over the insertion of the rectus muscles, the sclera is prone to rupture at this site from trauma. 5. Macula (fovea just below the number). This is the area of central and color vision. Acuity is greatest in this region. 6. Optic Nerve Head (notice the adjacent retinal blood vessels). 7. Retinal vessels supply most of the retina. Choroidal vessels supply the photoreceptors and the underlying choroid. 8. Vortex Veins drain the choroid and as indicated, the coalescence of orange vessels that form a whorled appearance. More detailed information can be found in our links.